The most tested, reliable and stable WRobot Levelling profile pack for Horde on private servers. The Demo is a 1-6 quester - Valley of trials. After which it will load the grinder. 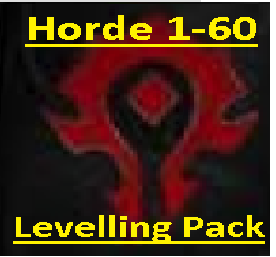 The Zip includes 1-60 Vanilla and 1-70 TBC Horde grinding packs, along with 1-25 Quester for Orc / Troll and start zones for Tauren + Undead. The profiles favour quiet grind spots with mainly beasts being the target. A Second main line grind path is included that will also target humanoids for those bots who need cloth. You are able to freely swap between profiles as they follow similar paths. The new V10 file has runcode added. Once your bot is finished with a zone the runcode will walk it to the next zone, talk to the flight master, set hearthstone and begin grinding in the new zone. Will also purchase gear dependant on the class. Included up to 35. added more steps in lower levels to smooth things out. Included up to 50. some steep jumps that need to be ironed out- 39-42 needs a stepping stone. new version uploaded to sellfy. Click the download now link from the purchase email to get the latest files. -Changed a few grind pulse points to remove loops on the main line. -Added black-spots where people reported Multiple deaths. -added alternate files for those who find the main line too busy. There should be 3-4 profiles available for every level. added black-spots + more vendors for main line. Added runcode to barrens section to attempt to get the bot to buy uncommon items between 15-20. Should help those bots who 'gear as they go' upgrading some gear. Not guaranteed as the items are not always available for sale by the vendors "Best effort". Added Tauren 1-12 file which should connect to the 12-60_V9. added 1-25 Horde Quester into the mix. Nice profile so far, leveling my mage and just hit 26 lvl. This profile features the quite area, avoid most of the quest area...so its relatively safer! Again, thank you, really save me a lot of time. lvl 41 rogue got banned at Felas. I guess it`s on me, I just left bot unattended the whole night (0-6am, server time, 6hours). so one suggestion for 41+ lvl (from Felas), better to be more cautious, there are some dedicated bot hunter running around. The Profiles Work as intended from what I have been able to use so far. My current challenge is that I can not make it past level 27 without getting banned on Elysium. It could be the profiles are just too heavily used. To be fair I am attempting to bot 24/7, so that might be the real cause of bans. I will set up another account and restrict it to 2 - 6hr sessions a day and see if I have better luck. Not a bad profile. Works up until about level 52 and then gets stuck in Ungoro. He dies constantly to the huge T-Rex that walks around the area. This guy is a legend, his profiles are great and his customer service is astounding! if he makes more profiles i need i will not hesitate to buy them!